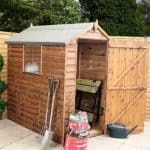 Modern gardens come in all shapes and sizes, and so it’s important that garden sheds are also available in different styles and dimensions. That’s the thinking behind this overlap cladded reverse apex shed. Put simply, it has an extra wide frontage which gives it a generous amount of storage space while still being suitable for shorter gardens. 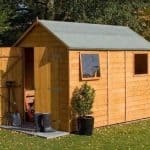 If you want a shed, but space is at a premium, this is certainly a shed worth considering. The front window is also a neat feature, as it allows you to look out onto your garden as you tinker in the shed. It’s large and attractive, and lets natural light illuminate every corner of the interior. We were pleased to see that the window features toughened glazing, which is an important feature in terms of both safety and security. The apex roof itself, whilst having a different orientation to many other sheds, still performs the two vital functions of adding extra standing and storage room, as well as keeping rain and snow away from the shed itself. 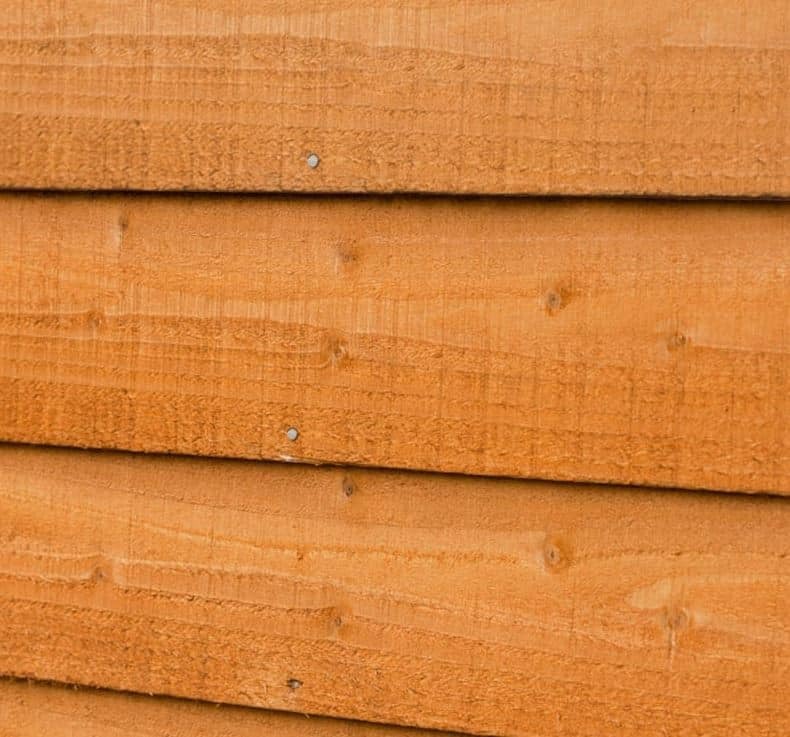 This, along with the dip treatment used during the manufacturing process, allows Shed-Plus to offer a ten year guarantee to all purchasers of this shed. We like sheds that offer solutions to consumer problems, which is why we were so impressed by the reverse apex design offered by this shed. 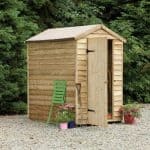 This makes it a perfect fit for gardens that would otherwise not be able to fit in a standard sized shed, such as those which are wider than they are long. It still benefits from all the advantages of an apex roof, primarily its effectiveness at causing water to slide harmlessly away. The strong solid sheet material of the roof itself is topped by traditional and attractive black sand roofing felt, giving extra weather protection. At its maximum height the roof is 1.98m, and the eaves height is 1.68m. One thing that immediately struck us is that the door is not particularly high, measuring 1.52m so be careful not to strike your head, although it has an adequate width of 0.66m. The shed depth, including overhang, is 1.33m and the shed width, again including the overhang, is 1.84m demonstrating the effect of the reverse apex. The 8mm overlap cladding is perfectly adequate for everyday use, and the design once more, just like the roof, naturally channels water away from the interior. Overlap cladding is a cost effective solution, but in this case it felt reassuringly tough. 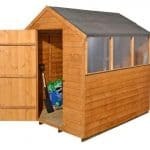 The frame used in this shed is of standard design, with dimensions of 28 X 28mm. We were pleased to see that the flooring is constructed of solid sheet Oriented Strand Board, as this is a tough substrate with good load bearing capacity. 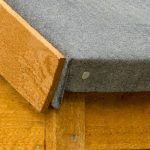 It was knot free and flat, another indication of the quality materials selected by the manufacturer. Sheds can be particularly vulnerable in their first few months exposed to the elements, so we always look closely at the pre-treatment used by the manufacturer. 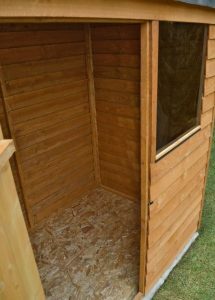 In this instance, Shed-Plus have subjected the wood to a single coat dip treatment. This process means that each timber is immersed in preservative and then allowed to dry naturally. This will give adequate initial protection, but we recommend that the owner applies further preservative coatings on an annual basis. This, indeed, is also a requirement of the 10 year anti-rot guarantee provided with the shed. 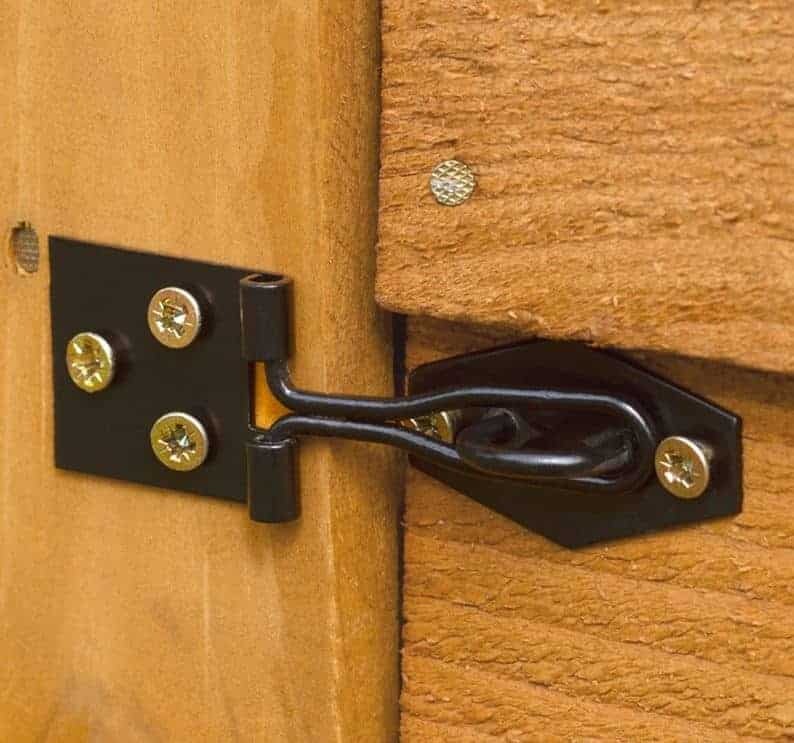 The single double hinged door comes with a hasp and staple that felt strong and well secured. No padlock itself is included, although they can be purchased as an optional extra. Adjacent to the door is a large fixed position window, in a 0.61m square design. 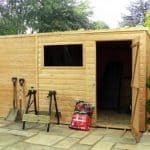 The front rather than side position is in keeping with the reverse apex of the shed, and gives the shed owner a better view of the garden itself. We were happy to see that the manufacturer had opted for styrene glazing, as this offers both clarity and toughness. 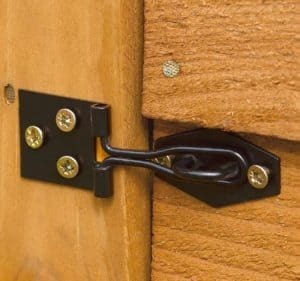 It’s an unfortunate fact that shed crime is on the rise across much of the country, and so it’s important that the two potential entrance points, the door and the window, are as secure as they can be. The hasp and staple door is designed to take a padlock, so this should be the first extra purchased. The styrene window also helps to add to the security of the shed as a whole, as styrene is considerably tougher than traditional glass, offering enhanced resistance to people trying to break it. If privacy is important to you, then you may want to think about hanging curtains over the generously proportioned window. On a summer day, however, the window also serves to heat the interior of the shed as well as illuminating it. This is a good looking shed in its own right, but left to itself the darkened appearance of the timbers caused by the dipping will rapidly fade. That’s one reason that we recommend painting or staining the shed, and there are two shades to choose from as optional extras: harvest gold and dark brown. This allows the user to decide whether they want a light and cheerful or dark and traditional shed, but whichever shade is chosen it will help to form a barrier against potentially harmful UV rays from the sun. The 6’ X 4’ base kit is another great addition to the shed, giving it a firmer foundation and elevating the shed’s base above the often moisture filled surface of the ground itself. 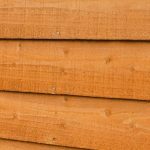 This in itself can help to add to the shed’s longevity, as well as keeping it warmer in winter months. Another optional extra available for this shed is solar lighting. It’s a low cost lighting solution, allowing you to use your garden shed in the early morning or twilight hours. Solar power is a very green option of course, and you can further enhance your eco credentials by adding guttering to the shed. This again helps to carry water away from the timber walls, but it also allows rainwater to be harvested for garden care purposes. 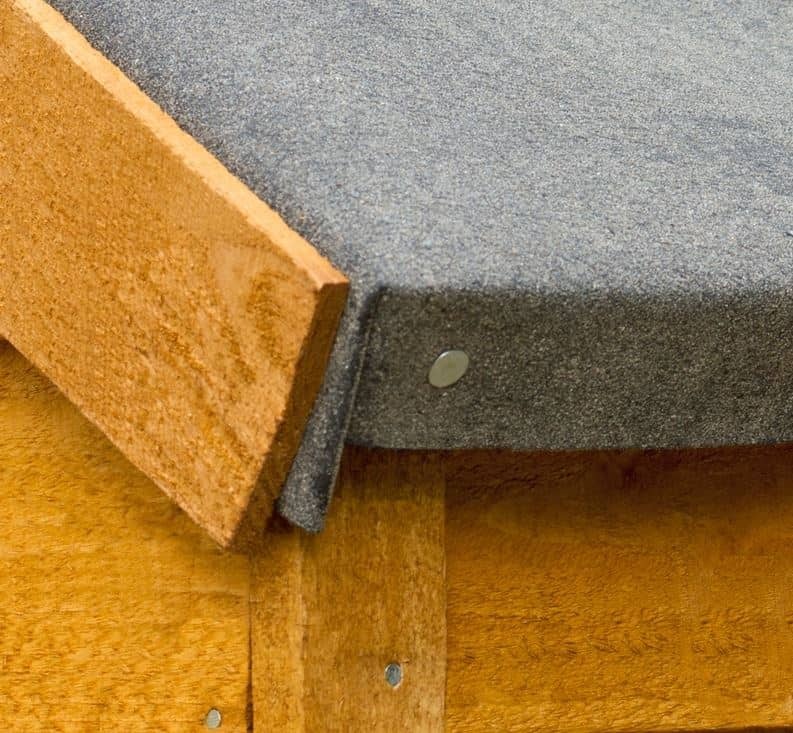 We were struck by the quality of materials used, from the roofing felt to the knot free OSM. This is a shed that looks and feels more expensive than it actually is. The dip treatment preservative process will keep rot at bay in that all important first year, but it’s important to realise that extra treatments will need to be applied on an annual basis. The wide front allied to a shorter depth is a clever way of creating storage space, and the height of the apex roof also gives all important extra capacity. Constructing and installing this shed was very easy, primarily because the instructions supplied with the shed were in plain English and easy to follow. 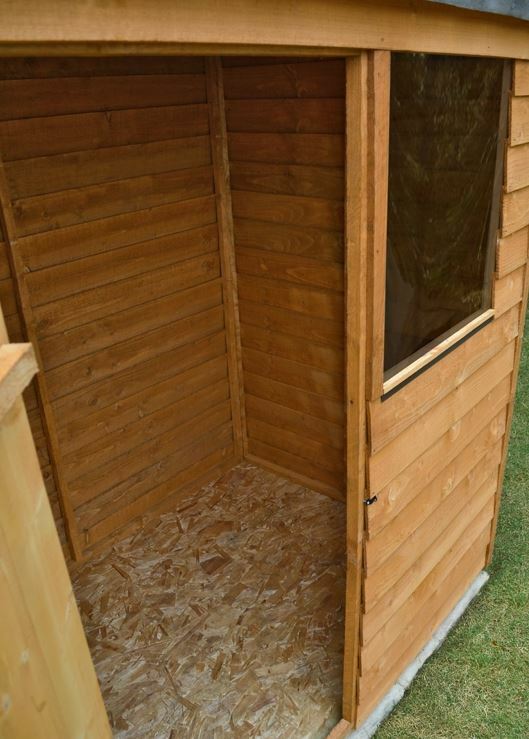 Two people can install this shed in less than three hours. 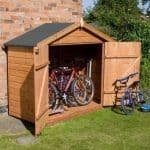 This cleverly designed shed can make an excellent secure storage facility, with the addition of a padlock and alarm, for a very reasonable price. The cost of annual treatment also needs to be factored in, but this in itself need not be expensive. 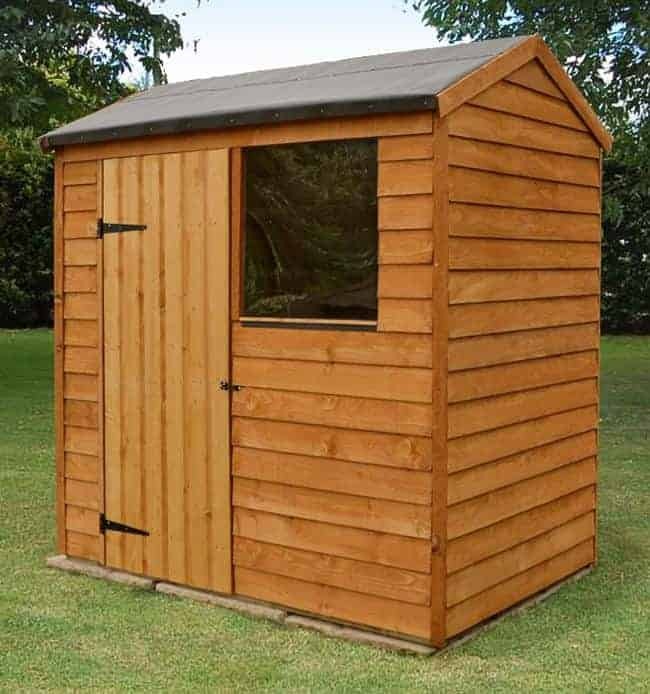 Final Thoughts: If you really wanted the advantages that a well built shed can provide, but thought that your garden was just too shallow to fit a shed into then this reverse apex overlap shed could be perfect for you. The wide frontage is very eye catching, and the tough styrene window will allow you to enjoy the garden itself, even if its raining outside. Weather protection comes as standard with this shed, thanks to the apex roof and the 8mm overlap cladding, so this really is a garden building that you’ll be happy to spend your spare time in.